Well were back to it!! To start off my week I made a wonderful wheat bread. I got this recipe from Smitten Kitchen. 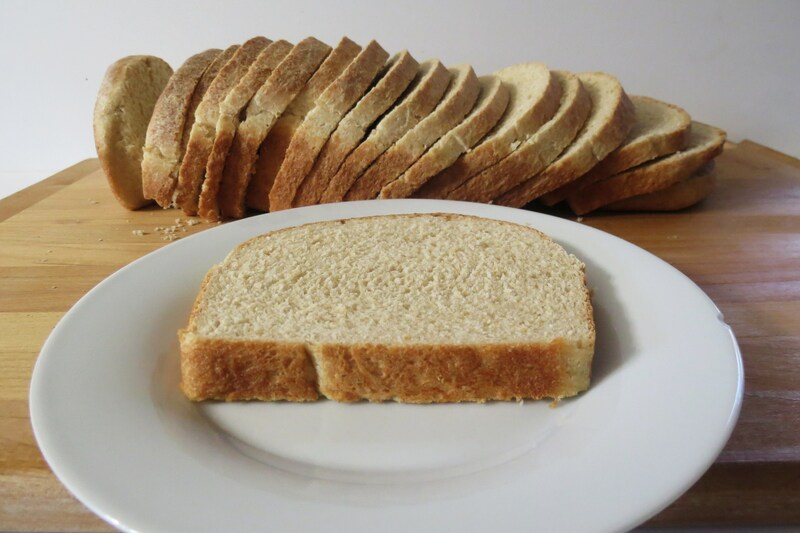 This wheat bread is so easy and doesn’t really taste much like wheat bread. That’s great for my family since my husband doesn’t like wheat bread. Little Jenny loves this bread, which is a plus. Making this bread weekly saves me money, tastes better than store-bought and gives me the satisfaction to know that I am feeding my family something healthy that I created. This recipe makes one loaf and I got 19 nice size slices out of it. The calories for each slice is 100 with 2 grams of fiber and 4 grams of protein. Now that I have the hang of this bread, I can add other things to it like ground flax, that will up the protein per slice. I pre-sliced the bread and placed it in the freezer so I can grab a few slices when I need it. You can also place the bread frozen in the toaster and it toasts perfect! Or you can place it in the microwave for about 15 – 30 seconds for a quick defrost or the best way is leave it out on your counter and it will defrost pretty quickly. Check out Smitten Kitchen for step by step photo’s. 2. Sprinkle high-gluten or whole-wheat flour on the counter, and transfer the dough to the counter, and begin kneading (or mix on medium speed with the dough hook). Add more flour if needed to make a firm, supple dough that is slightly tacky but not sticky. Kneading should take about 10 minutes (6 minutes by machine). The dough should pass the windowpane test and registers 77 to 81 degrees F. Lightly oil a large bowl and transfer the dough to the bowl, rolling it around to coat it with oil. Cover the bowl with plastic wrap. 5. Proof at room temperature for approximately 60 to 90 minutes (as in, original recipe says 90 minutes, I walked into the kitchen at 60 and said “whoa!” as it had almost risen too much; clearly final rising times vary), or until the dough crests above the lip of the pan. For dinner Sunday night, I was craving a sandwich. 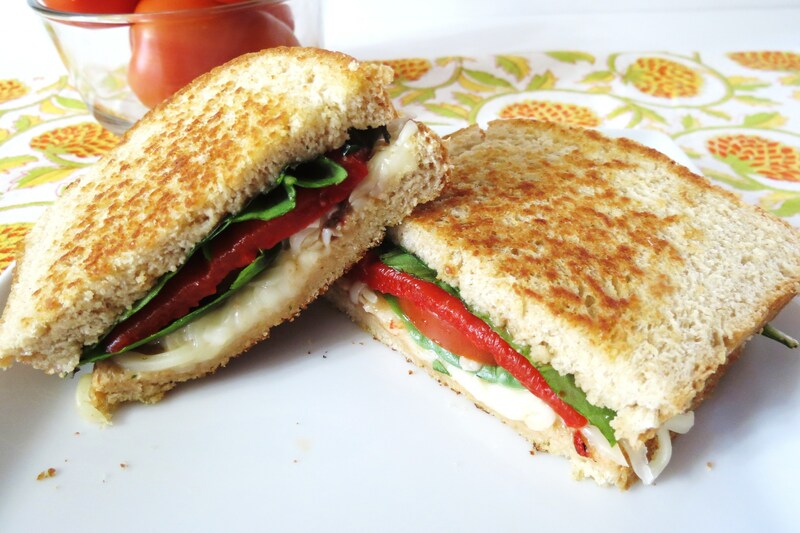 Besides my love for peanut butter and fresh bread, I also LOVE sandwiches. I could eat a sandwich at every meal. I don’t, but I could! 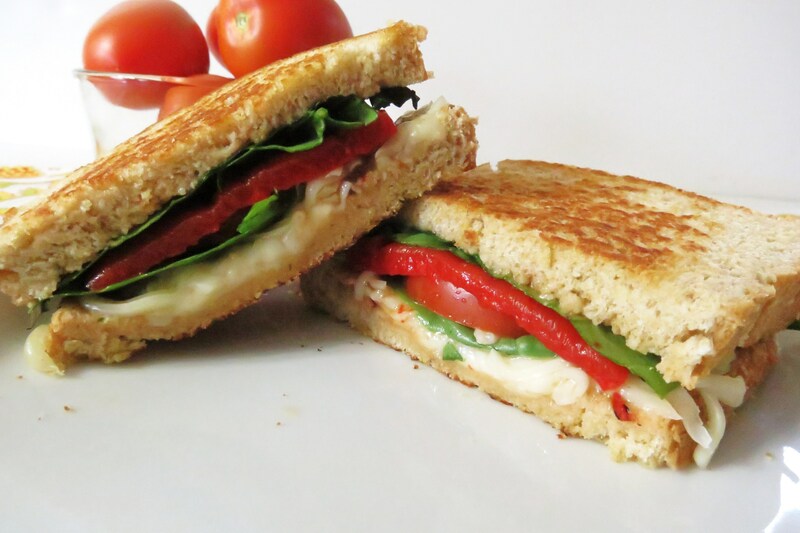 So for dinner I made this wonderful Caprese Sandwich with roasted red peppers. 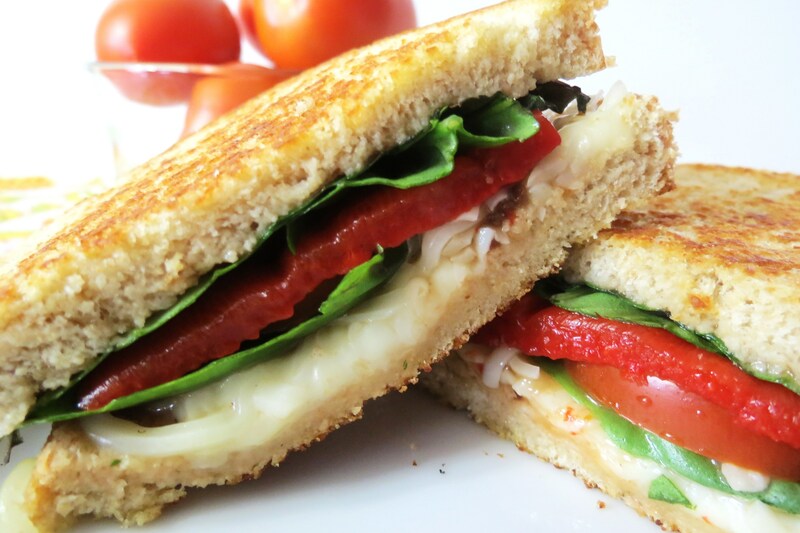 I used the Wheat Bread from Smitten Kitchen to make this wonderful sandwich. I just love dinners that are quick, easy and full of flavor. 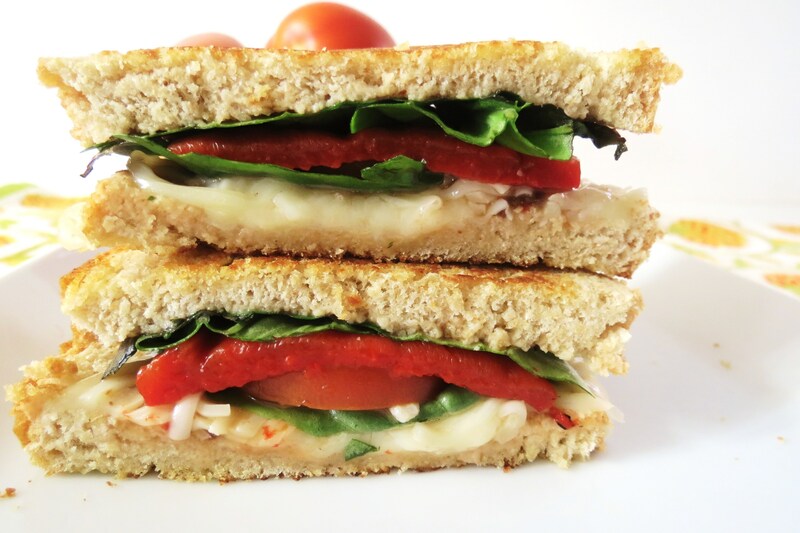 Caprese sandwiches are just about one of my favorite sandwiches. 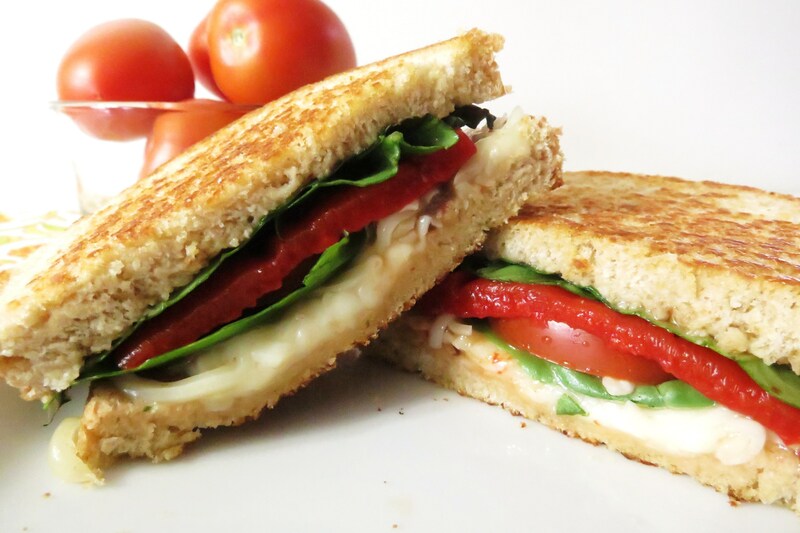 I love the flavor of fresh basil and this sandwich is chock full of it. Plus, you can never forget the melting cheese, ooh baby! I got stop talking about it, or I may just make another sandwich. Nothing wrong with that, it’s under 250 calories a sandwich, not bad!! Heat a skillet or panini maker on medium. Spray the bottom slice of bread that will be face down on the skillet with a few squirts of butter spray. On the inside bottom piece add 1/2 tablespoon of balsamic dressing, than add 4 basil leaves, tomatoes, pepper, 4 basil leaves and mozzarella cheese. Add 1/2 tablespoon balsamic dressing to the top inside slice of bread and place bread with balsamic dressing side facing down on to sandwich. Place sandwich on skillet and spray the top slice with spray butter. Cook until browned on the bottom, then flip and cook until bottom is lightly golden. Use a spatula to push the bread down so the cheese melts. Well I say it every time, but I’m going to say it again. Make bread! If I can do it, anyone can do it!! 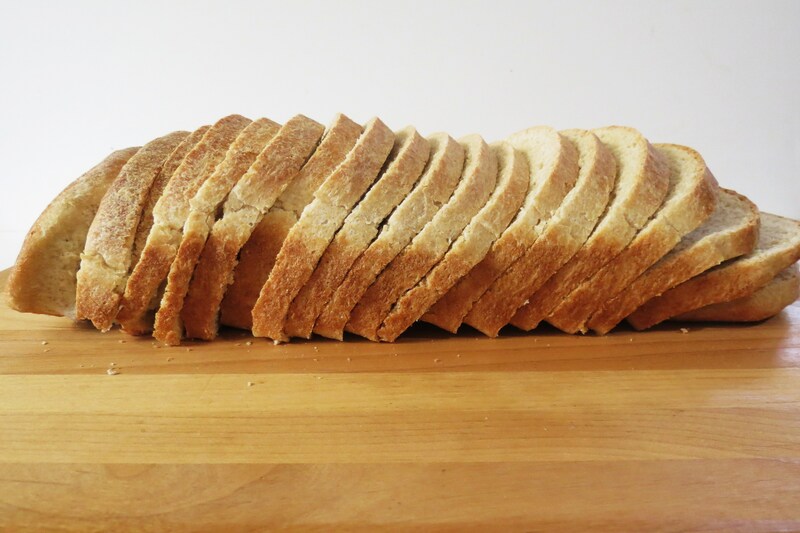 It’s easy and rewarding and this is a great bread to start with. Just think of the smell of fresh bread baking in your oven. I just love that smell. I like the smell of yeast too. I know that is weird!!! But hey, as you know I LOVE my bread and all components of it!!! I wanted to let you know I updated my Trader Joe’s page encase you want to check it out, there’s a few new items on there. One of the new items are blood oranges, and I want one right now, so I am off. Have a great week!!! Now I just need to invest in a large loaf pan.. Invest, and make it! It’s so good!! Homemade bread is THE.BEST. especially when you cover it in cheese and tomatoes and basil. Swoon. That loaf looks seriously fabulous! Thanks Joanne! I know nothing beats melted cheese on anything!! 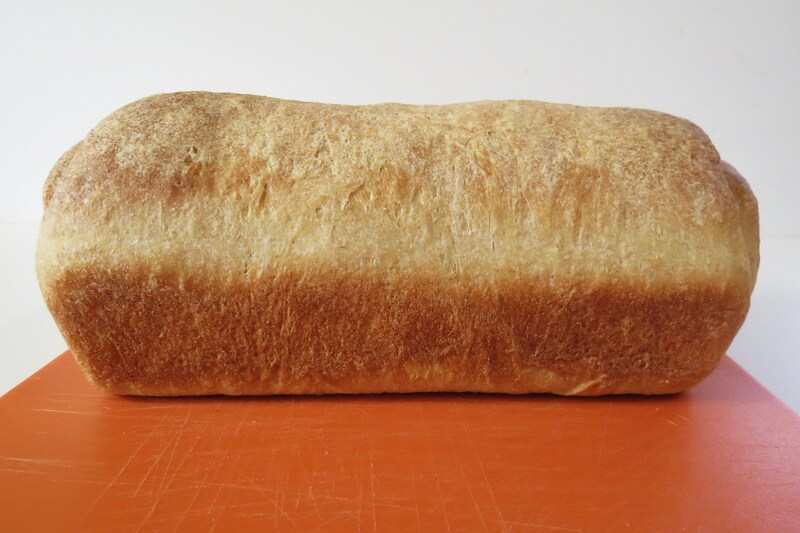 Jennifer, this wheat bread looks perfect! What a great job you did on it. Thanks for sharing! Jennifer this bread looks outstanding!!! Better than store bought. I love homemade bread and try to make two loaves at once to save time. Oh, your bread is PERFECT, Jen! I really need to try that recipe. And your sandwich is just scrumptious…I’d love that, too! Thanks Liz! Try the bread recipe. I’m so proud of it and it was so easy to shape and bake!! Gorgeous bread! I love making fresh bread, but I never think of using it for sandwiches; I always make it to go with soup or something with dinner. Going to have to try this! Normally I use it as a side with soup and stuff too, but my Husband always uses it to make him sandwich for lunch. It was perfect for a grilled sandwich. I’ve never made homemade bread if you can believe it! I need to get my act together. 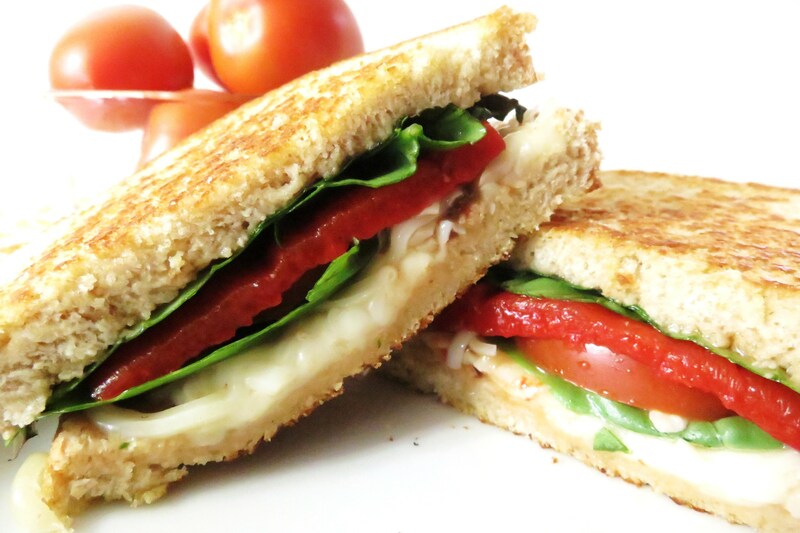 I *love* caprese sandwiches. Fresh mozzerella is my fave! Make homemade bread! I don’t know why but I find it so rewarding!! There is truly nothing better than homemade bread. I always say that I will make my own and knock the store-bought habit, and then get so busy and when something has go, sadly that’s it. Still, your bread (and sandwich!) look amazing! Thanks Kelly!! I know I love homemade bread, I still need to make your margarita (did I spell that right?) pizza!! I know I’ll love it!! You did a fabulous job with the bread! The sandwich looks great. Wow, those are some impressive nutritional stats – definitely goes on my to do list. And mmm, that sandwich looks absolutely amazing!